Ten Topics of Disrespect in the Workplace that Your Training Should Target! While the media regularly focuses on various types of drug use, there is another form of drug abuse that gets less attention -- abuse of Human Growth Hormone (hGH). You may have missed the story last fall in October 2017 about the 57 year old man convicted of distributing illegal hGH in the St. Louis area. He was given a 3.5 year jail sentence. His source for these substances? It was South Korea. Educate parents about hGH with this reproducible workplace wellness tip sheet that can help give parents the awareness needed to intervene and possibly save their child's life from this menace of illegal distribution of hGH. Here is a reproducible, editable tip sheet for human resource managers and employee assistance programs. The EAP literature of yesteryear used to be replete with these types of flow charts. I first distributed this free tip sheet a few years after developing it for another EAP, but if you look at it closely, you determine if it matches the program you serve or the one that serves your company. If not, tweak it with the editable format enclosed in the download. 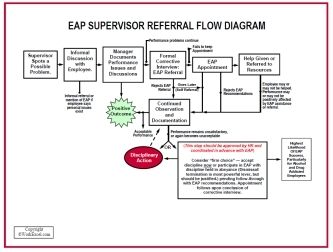 The power of this flow chart as a training tool comes from its ability to motivate supervisors to properly refer employees who have performance issues to the EAP, to follow them up--post-referral--more effectively, and act sooner if or when job problems return. Supervisors also are able to grasp the programmatic value of the EAP, see the program as a whole and not as "soft" self-referral only counseling service. Such a perception that been corrosive to the advancement of EAPs and their recognition by risk managers/property casualty insurers as near juggernauts for reducing behavioral risk to organizations--in addition to saving lives.